Michele Abeles mounts work at the Karpidas Collection & Dallas Art Fair in Sadie Coles HQ’s inaugural booth. Dallas Art Fair’s Brandon Kennedy visits with mega-watt contemporary gallerist Sadie Coles and artist Michele Abeles on work available at the Dallas Art Fair and Abeles’s self-curated exhibition at the Karpidas Collection. 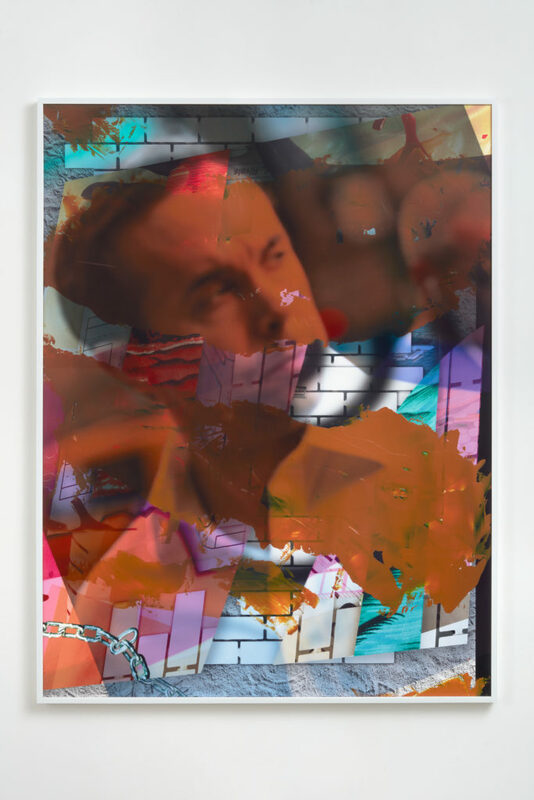 Brandon Kennedy: Could you tell us a little more about the work by Michele Abeles you’ve brought to the Dallas Art Fair? How do her disjointed constructions and use of multi-layered imagery speak directly to our current age of anxiety? Sadie Coles: For Dallas Art Fair we have brought four works by Michele–all 2018–originally shown at our Kingly street exhibition, world cup (01 November–15 December 2018). 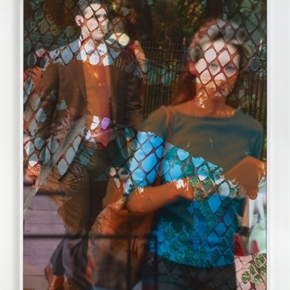 Two of these works present anonymous male subjects, unknowingly photographed by Michele and blown up into layered sublimation prints and backed onto aluminum, forming digital composites incorporating sections and motifs from her previous works. The process itself along with the visual layering combines ideas of temporality with a suggestion of surplus that many imagine inform much of the anxiety of our current age. 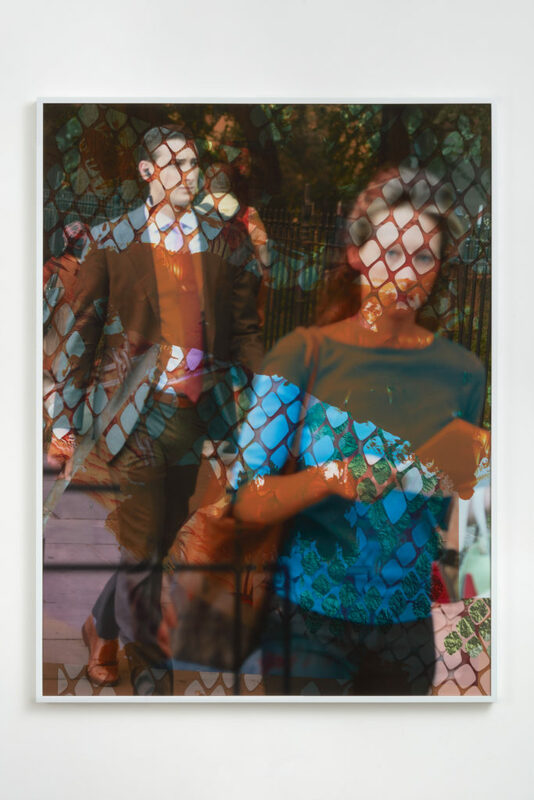 Moreover, through the anonymity of her male subjects–white collar workers typically seen as powerful, successful males–and their being unknowingly photographed by a female artist, the works play out a number of contemporary ideas concerning gender, power and psychology: themes we have seen elsewhere in Abeles’s work, such as in the earlier Watches series (begun 2014), which focused on female subjects captured in the streets of New York. The other works we are bringing employ abstract bricolage to consider themes of display, voyeurism, and self-perception or presentation–again, notions largely considered as intertwined with the anxieties borne from an age of social media, consumer status and ever-changing perceptions of value (of the self as well as of others). Brandon Kennedy: As you have been working closely with Pauline Karpidas for many years now, could you tell us a little more about that history and how Pauline’s support of emerging artists—such as Michele Abeles—has shaped your collaboration and close working relationship in developing the Karpidas Collection? Sadie Coles: I have worked with Pauline for many years. She was the first person through the door when I opened my gallery in 1997 and we’ve had a strong relationship ever since. Pauline has a deep belief in the elevating power of art and has a keen eye and insightful knowledge to match. Her generosity in sharing both her collection and her patronage has encouraged and empowered many colleagues, from curators and critics to artists and new collectors. She continues to be supportive of young galleries and new artists and it is this sense of discovery that energizes and engages. We first collaborated in the summer of 1997, when I was invited to organize a show on the Greek island, Hydra, focusing on the Young British Artists in whom she was interested and who I know well. Package Holiday included fifteen artists, who all came to the island for a weekend ‘package holiday’ around the opening of the show. Over the next 20 years we worked together on annual island exhibitions, focused on her recent acquisitions or specific commissions. Michele’s show in Dallas continues Pauline’s desire to have a platform to exhibit and discuss her recent interests. Brandon Kennedy: Michele, how does your artwork comment on excess: in terms of luxury, the adornment of self and the object of vanity (whether the home or office), and conspicuous consumption in general? And furthermore, what other concepts are explored in your work with your use of fake animal skins, reflective materials, and the layering of various media? Michele Abeles: Until my recent show at Sadie Coles HQ, I hadn’t thought about excess, luxury or how one adorns oneself. Consumption is lightly touched upon in a selection of works made in 2014 titled Watches and another (2016) which depict moments of transaction at store registers. In both bodies of work, consumption was less a subject and more a vehicle for exploring privacy issues (both online and offline) along with a loss of physical contact between individuals. Recently I made a series of works (exhibited at Sadie Coles HQ) which I conceived as ‘bricolage’ wall pieces in 2018. I imagined them to be the kinds of art that might hang in the homes or offices of plutocrats. I named these multipart constructions after different species of reptiles found in the swamps of Florida. I viewed them as trophy art. Those works were modestly sized yet had chunky ‘masculine’ frames, many of which are wrapped in imitation crocodile skin. Some were gilded with acrylic gold paint – the gilding was a material gesture used to point to a masking and upgrading. I would say I was exploring narcissism and not so much vanity. The way I understand vanity is as a concern about one’s physical appearance, and that could be included as an aspect of a narcissism. Whereas narcissism is a concern with self-perception and how one appears to others in terms of success, intelligence, charisma, etc., all of which can create a lack of concern about other human beings. Brandon Kennedy: Do you find we are all “waiting” for what will happen next? What will the government do next? How will our country respond? Michele Abeles: I certainly am waiting and wondering. Brandon Kennedy: How does the concept of this current political/cultural purgatory relate to the photographic images and complex construction used in these latest bodies of work shown here at the Dallas Art Fair? Michele Abeles: The works in this show were made between 2011 and 2016. It wasn’t until this past year (2018) that I contextualized work within a conception of waiting. However, time and contemporary experience has always been present in my work. Brandon Kennedy: You curated your own exhibition at the Karpidas Collection, could you tell us a little more about your methodology in doing so? Michele Abeles: I don’t view this project at the Karpidas Collection as a curated exhibition in the sense of putting my work in a dialogue with other artists or choosing works from the collection so that they fit into a curatorial theme. My methodology was straightforward in that I included all my works from the collection. All my works, except the largest, have been installed in the same room. The larger work was placed in a location that allows it to be viewable in tandem with my other works. I worked closely with Oliver Newton from 47 Canal (my NYC gallery) to come up with a non-linear installation that we hope allows viewers to make connections between works that might look different. With all that said, among my works there is an Ed Ruscha word painting (Spinach) and a Josh Smith painting, For Some Reason, which includes the grim reaper. Ruscha and Smith are two artists whom I like. Their placement next to one another and the resulting connections speak to my experience of this surreal contemporary moment. Brandon Kennedy: Regarding such, what revelations or surprises have come about during the planning of the exhibition? Michele Abeles: After going through the catalogue of work I was selecting from, I have to say I felt proud to be included in a collection that includes artists whose work I admire, such as Mike Kelley, Rosemarie Trockel, Louise Lawler, Stewart Uoo, Fischli and Weiss among many others. I was also surprised by how intimate it felt to see which works Pauline Karpidas has collected over her lifetime.